My persimmon tree is loaded with fruit this year. Enough for me, the birds, the squirrels and some to give away. 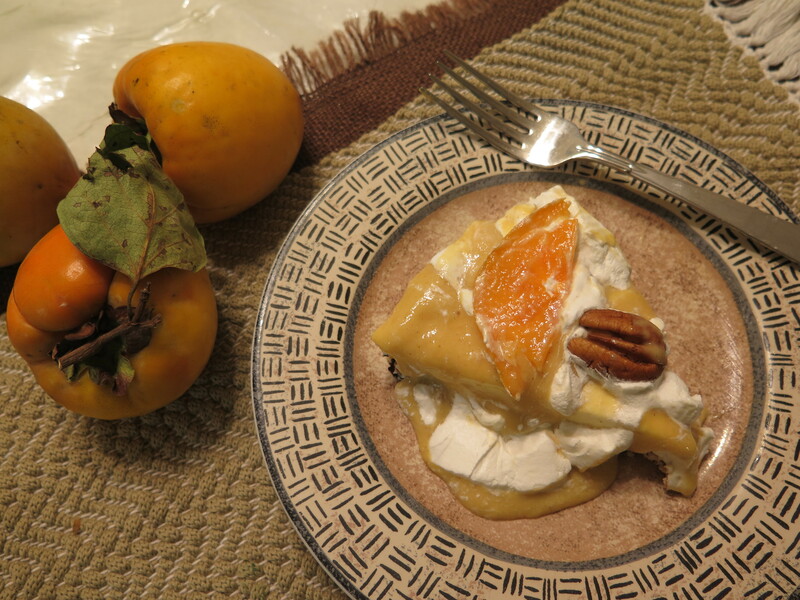 I have several ideas for recipes including a variation on a cheesecake and persimmon salsa. But I’ve never known what kind of persimmon tree is growing in my backyard. A search for answers led me on an adventure to a unique persimmon grove in the heart of Baton Rouge. I called several gardening stores to inquire about my tree and eventually the county extension agent for horticulture lawns and gardening, Bob Souvestre. He suggested I bring by one of my persimmons and see if I could match it to a variety growing in the persimmon grove at the Burden Museum and Gardens. And so I discovered the grove and found that I have an Hachiya persimmon. It is an astringent variety. The crazy thing is that I drive by the persimmon grove at the Burden Museum and Gardens to and from my job every day I work. I never knew this place existed. In the heart of Baton Rouge, surrounded by urban city, sits a 440 acre serene garden and farm. It is tucked away from view of the Interstate and surrounding streets. It has magnificent live oak trees and crepe myrtles, walking trails, horticulture gardens, a rose garden, Rural Life Museum and a research farm. 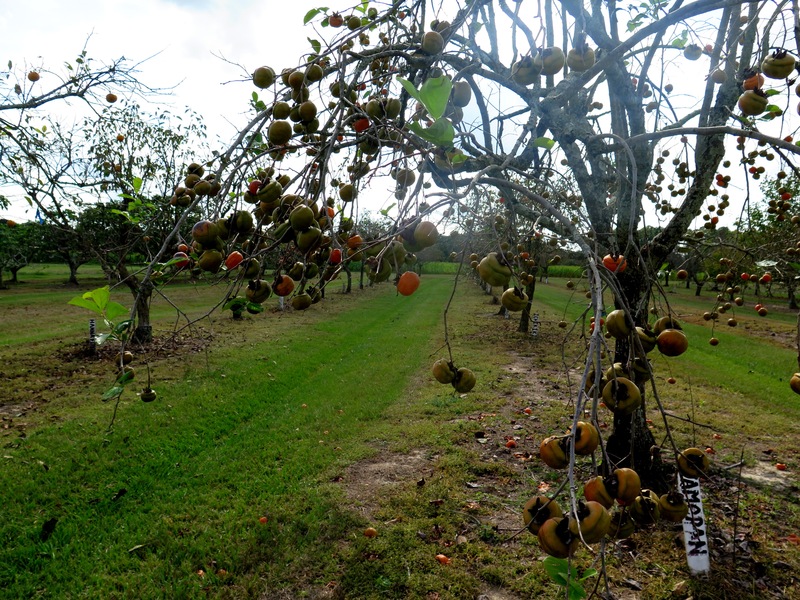 The persimmon grove has two rows of persimmon trees, each a different variety. There must be at least 24 varieties. I never knew there were so many persimmon types! Here is a Tamopan persimmon tree, with the unusual shape like an acorn. It is astringent, too. From the late 1800’s to 1900’s, Windrush plantation was a working farm owned by the Burden family. Beginning in the 1960’s, the remaining Burden family began to bequeath the farm and land to LSU and LSU AgCenter with the stipulation that it never be developed commercially. It was to be used for horticultural and agronomic research. Once in the countryside, the urban city has swallowed it up. Family member and horticulturist, Steele Burden, designed and planted much of what is on the farm. 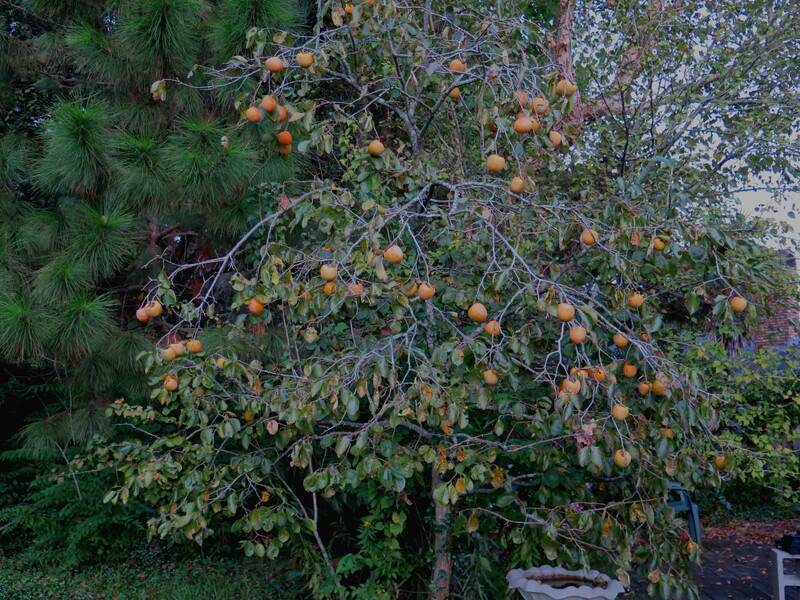 And here is my backyard persimmon tree, loaded with persimmons. The Baton Rouge Green Organization has a recipe contest every fall with dishes made from fruit and nuts that grow on Louisiana trees. I got second place last year with Persimmon Upside Down Cake, This year I have a rich and delectable recipe: Bayou Persimmon Mud Pie. It uses persimmons and Louisiana pecans. Before you say no way–that is atrocious–don’t let the name distract you. This is a take-off on a cheesecake with a rich pecan shortbread crust. It is also a variation of a southern dish, MIssissippi Mud Pie, which has layers of cream cheese, chocolate pudding and whipped cream. In this recipe, the first layer is a pecan shortbread crust. Layered on this is a cream cheese and whipped topping filling. Then vanilla pudding is mixed with persimmon pulp and spices. 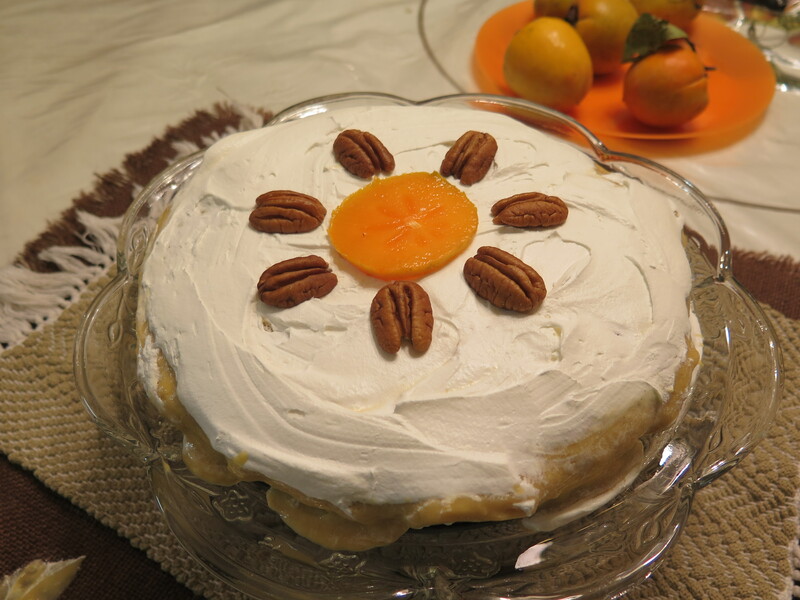 The top layer is a thin spread of whipped topping garnished with pecans and persimmon slices. My first try turned out a little gooey, but we ate it all–in other words, it was very good. I have a couple of weeks to get it right. In the mean time, I’ll have lots of persimmons to use. 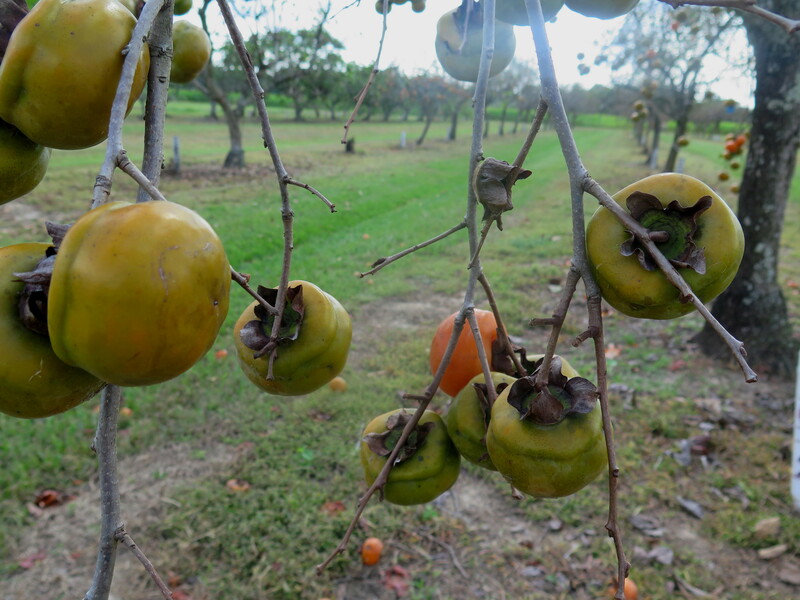 The Hachiya persimmon is an astringent variety and can be picked green. The fruit will ripen on your kitchen counter. 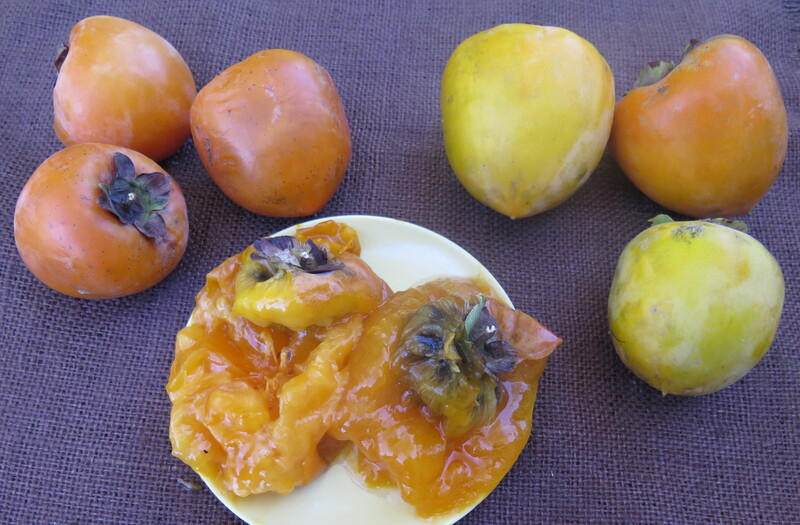 When ripe, the skin becomes soft and translucent (left), the interior is a gelatinous pulp and the persimmon is mild and sweet. Hence, these persimmons are best for cakes, puddings and sauces. Here are several fruit in various stages of ripening and the ripe pulp. 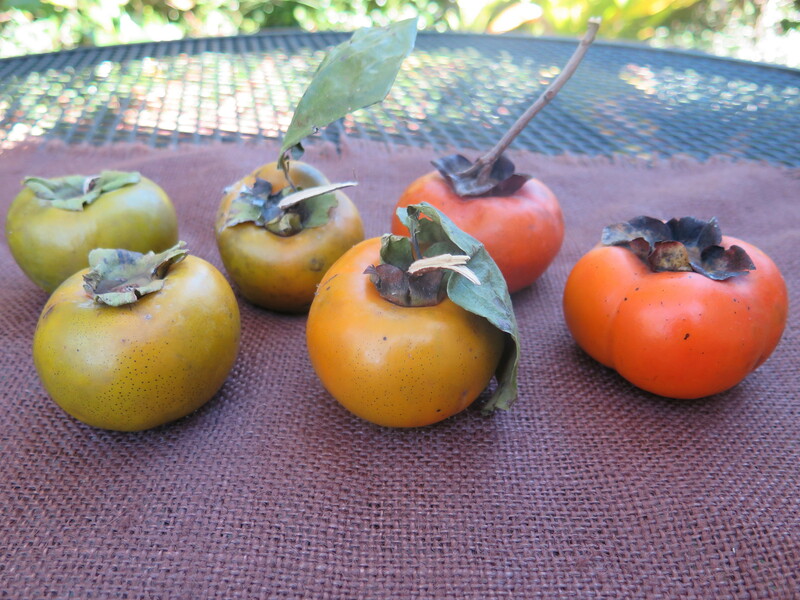 The Fuyu persimmon is a non-astringent variety and is becoming more popular. It looks like a squashed tomato. Fuyu persimmons taste more like a crisp apple or pear and can be peeled and can be eaten any time. They keep their shape and are good for baking, salsas, salads. Here are some from a friend’s tree (left) and the Burden grove. All persimmons are high in nutritional value including potassium, Vitamin C and Vitamin A, fiber and antioxidants. Place pecan pieces on a baking sheet, toast in oven for about 5 minutes. Immediately remove from baking sheet and chop to fine pieces, using a food processor. Set aside. In same food processor bowl, add flour, powdered sugar and butter which is cut into pieces. Pulse and processor until the butter is blended with the flour. This will be crumbly. Add the pecan pieces and process just a few seconds. Pour this into a round 9″ spring-form cake pan and press into the bottom of pan. Bake in oven about 20 – 25 minutes until browned. Remove and completely cool. In medium mixing bowl, whip together the cream cheese and powdered sugar until well blended. Fold in thawed Cool Whip. Spread onto cooled crust. In same mixing bowl add vanilla pudding mixes and 2 cups cold milk. Mix on medium speed for 2 minutes until thickened. In a small bowl, combine the persimmon pulp, cinnamon and ginger. Fold into the vanilla pudding. Spread onto cream cheese mixture. When ready to serve, spread a layer of Cool Whip on top, garnish with whole pecan pieces and persimmon slices. Carefully remove from spring-form pan. It was about a year ago that I began this blog. Time flies! Since that time WordPress has implemented a short code feature allowing a blogger to post a printable recipe. Yeah, WordPress. If you are a WordPress recipe blogger, that’s good to know and I’ll be glad to share with you how to do this. So I need to go back and fix all those old posts. I have several other persimmon recipes including a favorite, Persimmon Ice Cream with Frangelico Liqueur, and Persimmon Bundt Cake. Check these out, too, in the October 2013 archives. Anyway, I’ve enjoyed blogging over the past year and hope to keep it up. This entry was posted in Louisiana Culture, Louisiana garden, Recipes and tagged Burden Museum and Gardens, Hachiya persimmons, Louisiana gardens, Miississippi Mud Pie, pecan shortbread crust, persimmon cheese cake variation, persimmon grove, Persimmon Mud Pie, persimmons, WordPress recipe short code feature by Maylee at Beyond Gumbo. Bookmark the permalink.